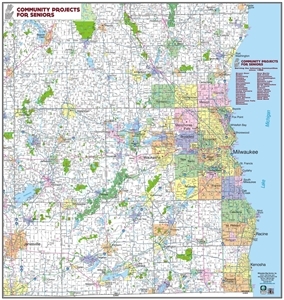 We have the ability to create unique maps for site locations, service areas, special events & much more. 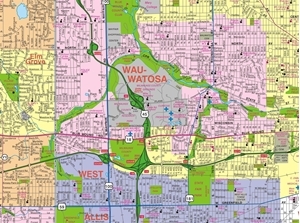 We have an extensive database of mapping information ranging from local street level detail to state and regional detail. Size is no barrier. 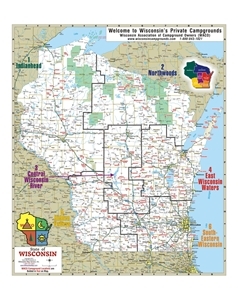 We provide maps from the size of a business card to maps that cover an entire wall. Please click on the link below. You will be directed to an online custom map request form. Please fill in the request form and we will respond with your map options. Some examples of our custom map work are below. Border lines marking territories or boundaries. 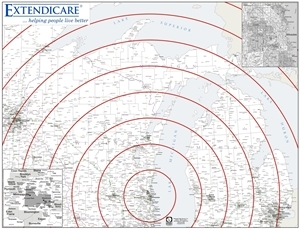 Concentric Circles showing Radial Distances from an Address - Milwaukee Map's cartographers can design a map for you of any area with custom concentric rings of any given radius. 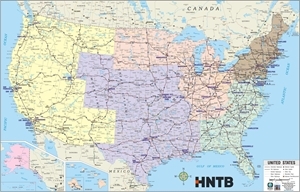 Show your sales or distribution territories on one of our United States or World Maps. Highlight locations already on the map or add them to a map. Show a delivery zone or sales territory by street.